Amtrak Capitol Corridor To Run Bike Share Program? While riding the Amtrak Capitol Corridor train again today I found a card advertising a survey (pictured at right). I’ve been riding the Capitol Corridor trains for years, and I had some time to kill on my one hour 50 minute trip, so I figured “why not.” I was a bit surprised, however, when I found out that the grand prize in a drawing of those that take the survey is a Brompton M3L folding bike. Seemed a little bit of an odd give-a-way item, and raised my interest even further. Once I started taking the survey I found out why that bike was associated with this survey. 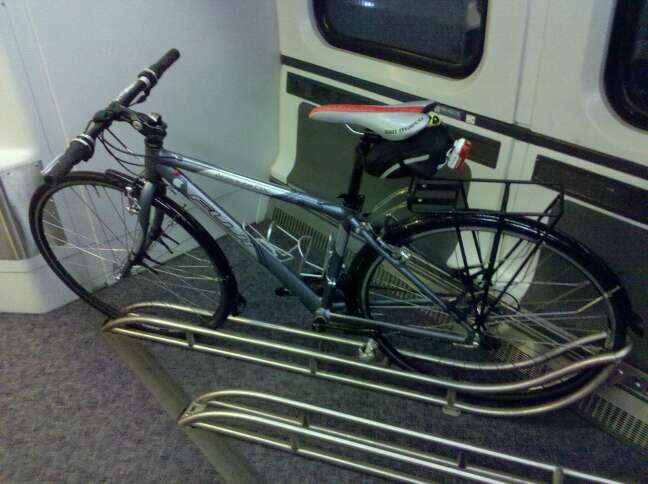 Seems Amtrak is considering running a rental-bike program.